I’ve been reading the Dark Screams books since the first volume – they’re quick reads for fans of horror fiction. This volume departs from the previous five volumes in some very slight ways. First we have the cover as depicted above. This is a new look for the series as the first five books’ original covers had a very different but similar to one another look. This cover definitely lets the reader know the type of fiction inside better than the older style. The other difference is a slightly larger page count but perhaps because this volume includes six short stories whereas all the previous volumes only included five stories. We’ll see if this continues or if it’s because one of the stories was significantly shorter than average. We start the book with Stephen King’s “The Old Dude’s Ticker.” This is early Stephen King and it shows. But for someone like me, who has only read the early Stephen King, that’s good news. The story deals with a Vietnam vet with PTSD. In his intro to the story, King lets the reader know that this was his playing around with the classic Tell-Tale Heart story and that until now the story has been unpublished. It’s not a great King story, but kudos to the author for sharing early, rough work. The next story is “The Rich Are Different” by Lisa Morton. This was a very different sort of story for me. In the story, a woman, who had written a book about ‘the rich’ is invited to meet one of the families she has written about. She has no clue just how different this particular rich family really is. I liked how Morton built the story and how the dark aspects of the story are subtler than most horror fiction. The sudden falling in love by the main character made the story end much too easily, however. I don’t know that I’ve ever encountered Nell Quinn-Gibney’s work before and “The Manicure” is my least favorite story in this collection. A woman hates having her fingernails touched, but decides to have a manicure and squirms with angst over getting the manicure and a demon tries to assure her that nothing untoward will happen. Done. “The Comforting Voice” by Norman Prentiss is unusual and a good read, but isn’t the sort of story that leaves the reader with lingering thoughts (which I think a good horror story will do). A very young child has grown attached to her grandfather’s unique voice – a voice deep and gravelly because of his throat cancer. When the grandfather passes away, the parents come up with another way to continue to sooth the child. Joyce Carol Oates is not someone I associate with horror fiction, but she has a story, “Situations,” in this collection. I could easily have done without this story as there isn’t much to it. ‘Daddy is always right’ and the children telling the story fear him. Easily the best story in the collection is the novella/novelette “The Corpse King” by Tim Curran. Curran’s use of language to set the tone is absolutely delicious. The story follows a pair of grave-robbers who supply bodies to a local doctor and scientist clientele. They stay just barely one step ahead of law enforcement, but can’t escape what lies in wait. It’s wonderfully eerie and a fun read. This series has stayed pretty consistent with the material they include. There always seems to be one story that I really don’t like and at least one that I like quite a bit, and then a few others that, while not particularly memorable, are at least interesting and worth reading. Looking for a good book? 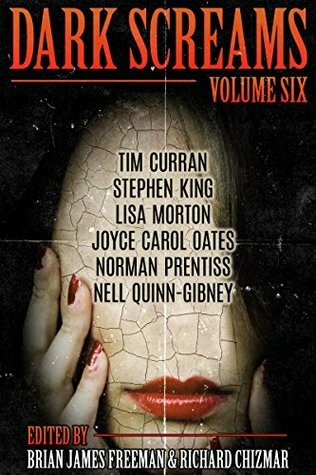 Dark Screams Volume Six has a fine collection of short, dark stories that will satisfy a reader’s hunger for horror.